Today, nearly 43% of the world is connected to the Internet, enabling us to talk, share photos, and conduct business halfway across the globe. As a result, we have seen more technological advancements in the past 10 years than we’ve witnessed in the past 10,000 years. And in the next five years, we’ll see even more. 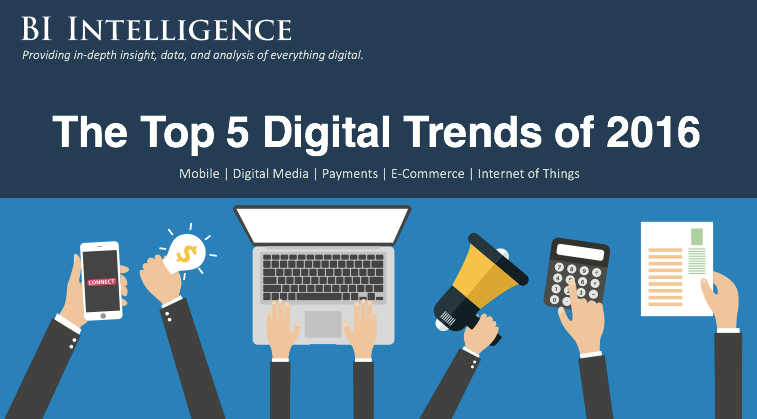 A new presentation entitled "The Top 5 Digital Trends of 2016," created by John Greenough of BI Intelligence, Business Insider’s premium research service, identifies the key digital trend in each of our top vertical areas including Mobile, E-Commerce, Digital Media, Digital Financial Services, and the Internet of Things. In Mobile, messaging apps have become the new OS. In Digital Media, programmatic advertising has exploded in recent years. In Payments, mobile wallets will be the story to watch in 2016. In E-Commerce, deliveries and shipping are changing drastically as more online shopping overwhelms shipping companies. In IoT, businesses are using the Internet of Things to lower their operating costs. Interested in getting the full slide deck? It's yours FREE! Simply click here to access it.